The OMB-DAQ-2416 and the OMB-DAQ-2416-4AO are highly accurate, multi-function measurement and control modules for the USB bus. These modules are 24-bit analog input devices for voltage or temperature, with eight digital I/O lines and two counters. In addition to the features listed, the OMB-DAQ-2416-4AO also includes four analog output channels with 16-bit resolution, ±10V output range, and an aggregate 1000 Hz update rate. With the addition of an optional OMB-AI-EXP32 analog input expansion module, the number of analog input channels on the OMB-DAQ-2416 or OMB-DAQ-2416-4AO can be doubled—increasing from 16 differential/32 single-ended inputs, to 32 differential/64 single-ended inputs. The expansion module also provides an additional 16 channels of DIO, bringing the total DIO count of the mated pair to 24. All features of the OMB-DAQ-2416 series module are included when the OMB-AI-EXP32 is attached, including the ability to accommodate thermocouples on any input channel, built-in cold junction compensation, and open thermocouple detection. 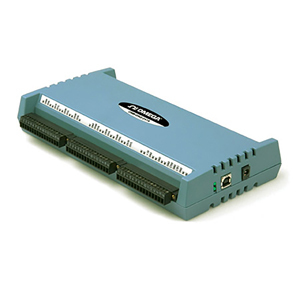 The OMB-AI-EXP32 can be plugged directly into a OMB-DAQ-2416 series module. The packaging for the OMB-DAQ-2416 series and the OMB-AI-EXP32 ensures ease of use in a variety of applications. Detachable screw terminals facilitate attaching and removing without re-wiring. The modules can easily be DIN-rail mounted for rack applications. The OMB-DAQ-2416 Series modules ship with an impressive array of software, including TracerDAQ®, a full-featured, out-of-the-box data logging, viewing, and analysis application. Driver support and detailed example programs are included for Universal Library programming libraries for Microsoft® Visual Studio® programming languages, and other languages, including DASYLab®, and ULx for NI LabVIEW® (comprehensive library of VIs and example programs compatible with 32-bit and 64-bit LabVIEW 2010 or later) and InstaCalTM installation, calibration and test utility-powerful solutions for programmers and nonprogrammers alike. These modules operate under Microsoft Windows® VISTA/7/8/10 (32-bit and 64-bit) operating systems. TracerDAQ PRO is an enhanced version of TracerDAQ. A comparison of some of the features included in TracerDAQ vs TracerDAQ PRO is shown on the PDF. Number of Channels: 16 differential/32 single-ended (thermocouples require differential mode) on OMB-DAQ-2416 or OMB-DAQ-2416-4AO. The OMB-AI-EXP32 is a multiplexer-based channel expansion module that adds an additional 16 differential/32 single ended channels. Open Thermocouple Detect: Automatically enable when a channel is configured for a thermocouple sensor. Configuration: Each DIO bit can be independently read from (DIN) or written to (DOUT). The DIN bits can be read at any time whether the DOUT is active or tri-stated. 참고: Comes complete with AC adaptor, 2 m (6') USB cable, US power plug, quick start guide, software, and operator’s manual on CD.